Photo Courtesy of the National Woman’s Party, Manuscript Division, Library of Congress. Photography: Harris and Ewing. Beatrice Reynolds Kinkead of Upper Lake, California, 100 miles North of San Francisco, was a continent away from the infamous Occoquan Workhouse in Virginia, but it was almost inevitable that she would eventually journey from one place to the other. The same kind of drive and commitment that led her to excel in academics would carry over into her work for the suffrage movement. Like many others, she became involved in the suffrage cause during her college years. In 1893, while she was an undergraduate at the University of California, a coalition of Golden State suffragists, W.C.T.U. members, and even a number of groups that had never been involved in suffrage before, united to get the State Legislature to pass a school- suffrage bill allowing women to vote at any school election and run for any school office. But it never became law. The Governor said he had concerns about the constitutionality of the measure, asked a law firm to study the matter, and by the time the lawyers made their report, the deadline to sign the bill had expired, a great convenience to the Governor, but a source of great exasperation to suffragists. Though Reynolds was busy with her studies, becoming one of the first women to earn a B.A. from the University of California on February 12, 1895, and an M.A. in 1897 (her thesis was “The Vague Supposition in Plato”), she still found time to help the cause. In 1896, while still pursuing her M.A., and teaching in a San Francisco high school, she was quite active in the local suffrage league. That year, suffragists convinced the legislature to bypass the governor, and put woman suffrage directly on the ballot for the state’s (male) voters to decide. Though the referendum failed, due to a massive, last-minute campaign by alcohol interests, everyone who took part gained experience, and had the chance to work with nationally-known suffrage advocates. Even Susan B. Anthony spent a substantial amount of time in California during the campaign, and clearly would have been a great inspiration to Reynolds and all the local suffragists she encountered on statewide speaking tours. Reynolds became a teacher of Greek and Latin at a high school in Centerville, then in 1898 moved East to teach at the Shipley School in Bryn Mawr, Pennsylvania. She must have made quite an impression, because by 1899 she was teaching Latin at Vassar, and was a “Fellow By Courtesy” at Bryn Mawr. But in 1900 she moved back to California, teaching Greek at a Los Angeles high school for one year, then Greek and Latin at a San Francisco high school from 1901 to 1903. It was during this time that she married James Alan Kinkead, on August 8, 1902. 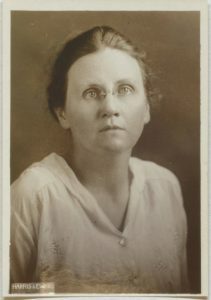 The young couple soon moved to Montclair, New Jersey, where Beatrice would give birth to four children (Robin, James, David and Donald) between 1906 and 1911. Though busy raising a family, the New Jersey Suffrage Referendum of 1915 would bring another suffrage campaign to her doorstep, and she could not ignore the call to duty. The loss of the referendum in New Jersey, as well as defeats in three other big Eastern states two weeks later, plus impatience with President Wilson’s failure to endorse nationwide woman suffrage now made the National Woman’s Party’s militant tactics and total focus on the Anthony Amendment more attractive to her than the state-by-state approach and polite lobbying of Wilson by the National American Woman Suffrage Association. She first began going down to D.C. to be a banner- bearing “Silent Sentinel” picket along the White House fence on “New Jersey Day” in February, 1917. But the friendly spirit of those pre-war days was long gone by July 14, 1917, when she and 15 other picketers were arrested on false charges of “obstructing traffic” on the wide Pennsylvania Avenue sidewalk. After 6 months of widespread publicity for the Sentinels, and acute embarrassment for a President whose vigorous support for democracy worldwide was being conspicuously contrasted with his apathy toward bringing democracy to the female half of his own country, pro-Wilson judges set out to crush the dissenters through harsh sentences. But jail terms of up to 60 days imposed for what – even if they had been valid – were trivial charges, backfired badly, so public sympathy for the pickets and outrage toward the Administration soon began to increase. Though willing to serve their full terms, the first pickets to be given lengthy sentences were quickly pardoned by the President, so Kinkead was in Occoquan for only three days. Following the successful conclusion of the suffrage campaign, she spent the rest of her days as a translator of books, mostly for children, and generally about science. As the Second World War approached, she spent a good deal of time in the Soviet Union, and advocated greater cooperation between Americans and Russians against the growing threat of Fascism. By the end of her life, she was back home in California, a state whose suffragists didn’t give up after the setbacks of 1893 and 1896, and who won the vote through a referendum in 1911, nine years before the 19th Amendment was ratified. Sources: After the Vote Was Won: The Later Achievements of Fifteen Suffragists by Katherine H. Adams and Michael L. Keene., pages 118-122; Becoming Citizens: The Emergence and Development of the California Women’s Movement, 1880-1911 by Gayle Gullett, pages 80-82 ; “Bryn Mawr College Program, 1905-6”; “Picket Tells of Prison Life,” New York Times, July 22, 1917, page 5; Jailed for Freedom by Doris Stevens, part 8. Winning The Vote: The Triumph of the American Woman Suffrage Movement by Robert P. J. Cooney, Jr., pages 348-49.